Antiquaires since 1970, siret: fr 24.430113233. 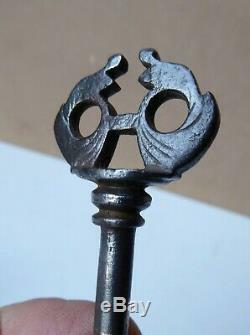 Key openwork head, wedding cabinet, seventeenth century. Beautiful key head of a cabinet or wedding furniture of the seventeenth century, decorated with openwork and engraved, showing the two rings, and two bent servants waiting for the bride .... beautiful broad base and tour, typical from the time louis xiii. The stem and the bit are unfortunately a replacement. Dimensions: 9cm x 3,5cm. French work xviiie, charming key. Our warranty commits us as follows: we are not experts, but we refund 100%, without questions and with our apologies, any person disappointed by our shipment, within the reasonable period of 15 days. No risk for our customers! The sending of this object 0 for France, and 20 for Europe. 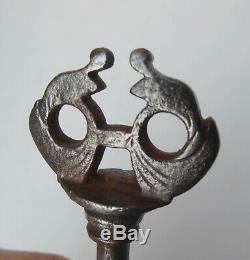 Openwork head key, wedding box, seventeenth century. A beautiful key head of a seventeenth century cabinet, decorated with openwork and engraved, showing the two rings, and two beautiful hands. The stem and the bit are unfortunately a replacement .... dimensions: 9cm x 3,5cm. 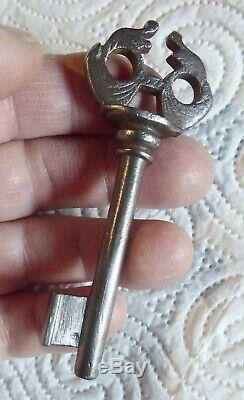 French work 17thc, charming key. The item "openwork key, 17th century openwork key, wedding box, 17thc" is on sale since Friday, February 15, 2019. It is in the category "art, antiques, objects of the nineteenth and before". The seller is "dany46" and is located in bellegarde, in camargue.